Come out this weekend! September 8th and September 9th – 11 – 7pm. 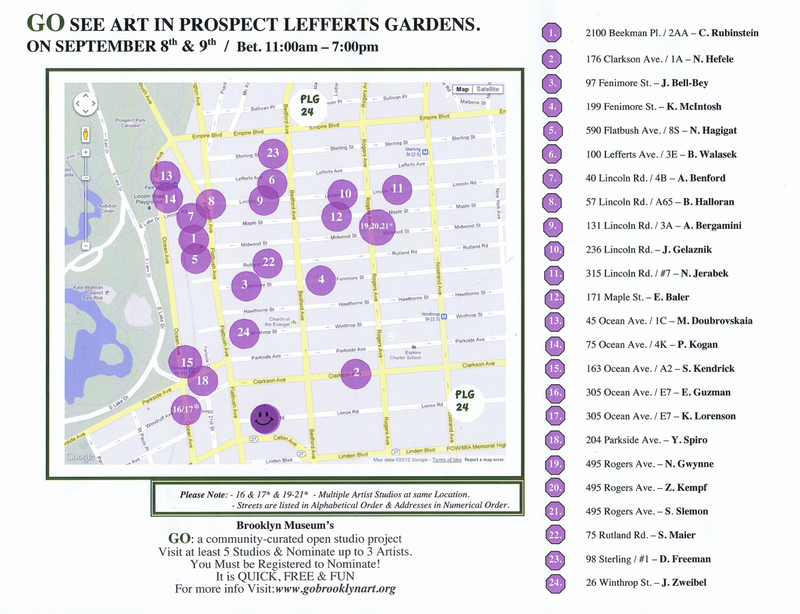 Each tour will include visits to more that 5 Studios in Prospect Lefferts Gardens. In general, all Tours will be Approx. 2 – 3 hrs long and will depart from PLAY KIDS at 676 Flatbush Ave.
On September 8 and 9, artists throughout Brooklyn will open their studios from 11 a.m. to 7 p.m. You can watch this video for a quick introduction and then browse artists here. If you want advice about how to approach the open studio weekend, check out the tips for voters. If you register and check in to 5 studios, you can nominate up to 3 artists for an exhibition at the Brooklyn Museum. Although pre-registration is not required to visit studios, we recommend registering now, so you can create an itinerary, check-in, nominate, and more. Visit an information spot to pick up a printed map. Our main meet point outside of Borough Hall – convenient to all subways – will be open from 11am to 7pm Saturday and Sunday. Or, you can visit any of our information spots, but note that hours vary by location, so read the fine print! If you have an iPhone, download our GO app to explore an interactive map of GO artists, see photos, get directions, and edit your itinerary. If you have another type of smartphone, you can use our mobile website by visiting the GO website on your phone. You can check in to studios using the GO iPhone app, text messaging, or entering artists’ codes on the website. Look for instructions and the artist’s code on a poster in the artist’s studio. You just need to submit check ins by Monday, September 10 at 11:59pm EST. Looking for food or rest stops in PLG and other neighborhoods? See our series of neighborhood guides. Review FAQs in our support area, and check the GO news and/or Twitter for last-minute announcements. Need help? Visit the PLG information spot at Play Kids (676 Flatbush Ave. – Cor. Westbury Ct.) from 11am-3pm on Saturday & Sunday where GO staff will be on hand to answer questions.